RBTH presents a selection of views from leading Russian media on international events, featuring reports on an official announcement in Brussels of EU opposition to the termination of Russian gas transit through Ukraine, a Central Bank report on the effect of sanctions on food imports to Russia, and talks between Iran and Russia on the possibility of supplying Tehran with the Sukhoi Superjet. The business daily Kommersant reports that the European Commission has for the first time officially criticized plans by Russian gas giant Gazprom to stop the transit of gas through Ukraine in 2020 and has made it clear that it opposes any projects aimed at this goal. In order to continue to implement the contracts after 2020, Gazprom plans to build a gas pipeline to Turkey and a second pipeline from Russia to Germany under the Baltic Sea (Nord Stream-2). 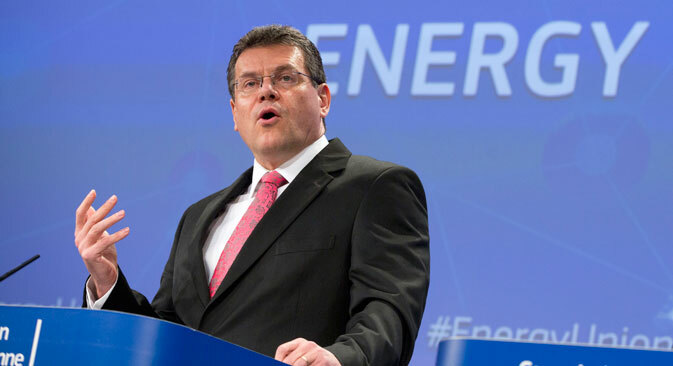 Vice President of the European Commission, in charge of Energy Union, Maroš Šefčovič, said the termination of gas supplies through Ukraine would have very negative consequences for energy security in Europe. At the same time, the newspaper has learned that a group of members of European Parliament, led by former Estonian Foreign Minister Urmas Paet, have sent an appeal to the European Commission asking to prevent the construction of Nord Stream-2. Estonia does not belong to the countries through whose maritime territory Nord Stream runs, but Gazprom will have to discuss the environmental aspects of the project with all the Baltic States. Kommersant reminds its readers that Europe is now looking for an alternative to Russian gas. If successful, the gas transit through Ukraine will also seriously decrease, but “this does not bother the European Union for some reason,” stressed a Kommersant source from Gazprom. “When the EU is building interconnectors, for which there is no gas altogether, it develops the market, but when we are building real new routes, they are ‘redundant infrastructure,’” the source added. The source recalls that Ukraine now provides less than half of Russian gas transit to the EU, while the rest goes by pipeline. The daily broadsheet Izvestia reports that in its last quarterly report on monetary policy, the Central Bank of Russia found the impact of sanctions on the importation of goods into Russia to be insignificant. The decline in imports, which first began in August 2014, was mainly due to the weakening of the ruble and the decrease in business activity in the country, the report said. The decline in imports to Russia of the products that fell under Moscow’s food embargo amounted to only 7.2 percent of the total reduction in imports. The import of food and agricultural raw materials fell by 42 percent in the first quarter of 2015. But in spite of this reduction, the share of these products in the total volume of Russian imports has not changed significantly (in the quarter of 2015, it amounted to 14.1 percent). The import of foods and raw materials from a number of foreign countries has significantly decreased – the embargo applies to the United States, the European Union, Canada, Australia and Norway. But the suspension of imports of foods and raw materials from these countries has been compensated by the increase of supply from the others, primarily from Latin America. Commercial Director of the Customs Division of the company FM Logistic, Alexei Misailov, told the newspaper that Russia has always been and will be a huge sales market for other countries, while competition between suppliers from different countries has always been present in the food segment. Citing Minister of Transport Maxim Sokolov, the business daily RBK writes that Russia and Iran are holding negotiations on the supply of Sukhoi Superjet SSJ100 passenger aircraft to Tehran. According to the minister, the partners from Tehran are interested not only in the SSJ100, but also, specifically, in automotive equipment. RBK adds that the Russian machine-building corporation Uralvagonzavod plans to supply freight cars to Iran and is discussing the assembly of the rolling stock on the territory of the republic. Upon the lifting of Western sanctions against Iran, the potential volume of the local market for freight cars could amount to 10,000 units. Uralvagonzavod may begin shipping supplies by the end of this year. The corporation's spokesman declined to comment, but noted that, in the case of the lifting of sanctions, Uralvagonzavod is ready for cooperation. The newspaper reminds its readers that the P5+1 group of six world powers (Russia, the U.S., China, Britain, France and Germany) signed on July 14 an agreement concerning the Iranian nuclear issue, which will allow the economic sanctions imposed on Tehran by the European Union and the United States to be lifted.